However, I’m quite pleased with Ego’s warranty service compared to the last time when I had to take the mower to Home Depot’s service department (who kept it for 5 weeks). 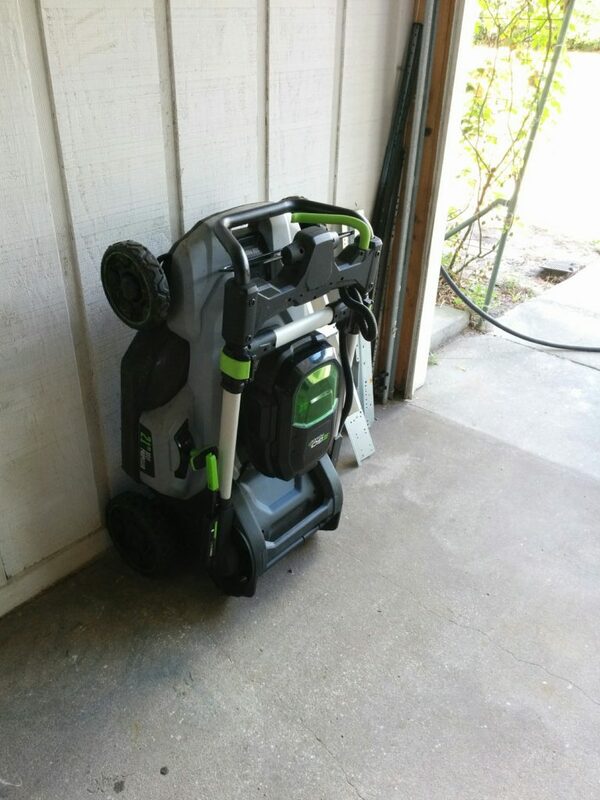 I have read many accounts on Ego’s customer web forums of other self propel units failing, so they may have had a bad batch of mowers go out and are now being more pro-active about replacing them. Alternatively, maybe I’m getting a replacement mower shipped out quickly because this is the second issue I’ve had. Regardless, receiving a working replacement in 5-10 days is much better than taking 5 weeks for a repair. I’m still going to have to push my mower to mow the lawn (and it’s a big lawn, so this is more exercise than I am looking for….) but at least I could use the defective mower as a push mower until the replacement arrived and didn’t have to hire a lawn service while it’s in the shop. The new mower arrived 11 business days after my phone call (it would have been 10, except UPS had a delivery exception and delayed it over a weekend, which meant I had to push the old mower around one more time. After using the new mower with its super quiet and silky smooth self propel, I can say that the self propel unit that home depot repaired/replaced had many signs of problems before it finally gave up the ghost. First, it was louder than the mower itself. Second, it didn’t have enough power to fully propel the mower up a slight incline. Third, every time the mower went into overdrive due to thick grass, the self propel would slow down. These issues were either there from the time I got the mower back from Home Depot, or they started and got worse so gradually that I hadn’t taken note of them, but after using the new mower, it became obvious that I should have known my self propel unit was not working the way it was supposed to. On the new mower the self propel has plenty of power to move up a grade at the same speed it moves on flat ground, it makes less noise than the blade mower, and it doesn’t slow down when the blade mower goes into “overdrive” cutting thick grass. I purchased a 21″ Self Propelled EGO lawnmower in April of 2017, and although the mower’s manufacture date code was listed as Sep 2016, the 7.5 AH battery (Original Battery) that HD gave me (shipped separately and lost for a week) had a date code of Dec 2014. I just (July 2018) purchased a second brand new 7.5 AH battery that has a manufactured date code of May 2018 so that I can mow twice as long, and be charging one battery while mowing with the other. To monitor the performance and lifespan of these (relatively expensive) batteries, I have been periodically testing their capacity by draining them to the same level (when the red light on the mower comes on) and then measuring how many watt/hrs it takes to fully recharge them using a Kill-a-watt meter. In this way, I can compare the original battery (both last year and now) to my new battery. New Battery, July 2018: 410 watt/hr to recharge. I didn’t start keeping track of how much power it took to recharge the original battery until August of 2017, so I don’t know if it was at the 410 level when I originally received it or not. It’s calendar age from the date of manufacture was 2+ years old when I received it in April of 2017, and I estimate it probably lost 7% of its capacity before I started the measurements. The original battery has lost approximately 13% of it’s capacity over the last year from the point I started keeping track. Right now, my brand new battery is 19-20% “better” than my original battery (which is 3+ years old and has been in active use for 15 months). Just for fun, here are two graphs of the data points I have for my original battery over time. The first one shows how the degradation appears to be mostly linear (at least over the last year) but looks scary, because OpenOffice cheated and auto-scaled the vertical axis to only include the data points. This second graph represents the total capacity “under the line” is a better visual representation of reality, as only 13% of the original capacity was lost over this time period (20% when compared to a brand new battery, so the other 7% was likely lost in the years of storage before I received the original battery). 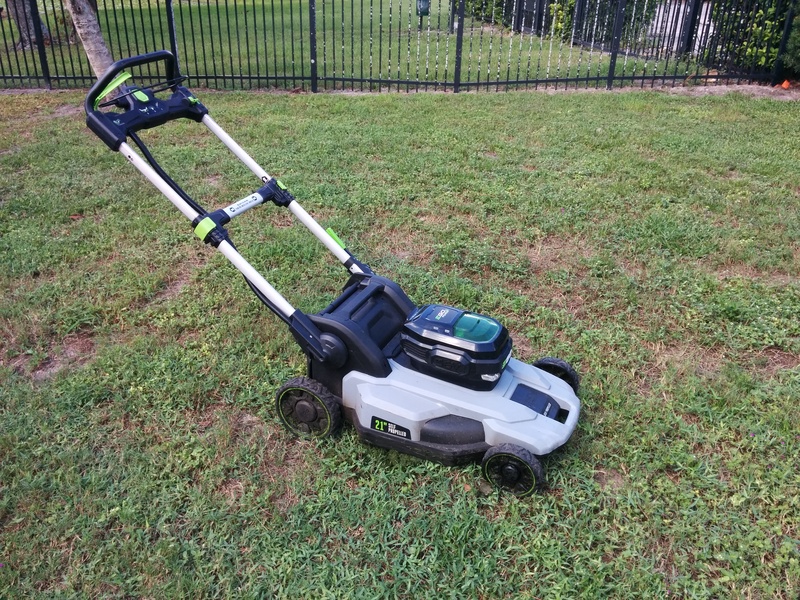 Five months ago I purchased an Ego 21″ Self-propelled electric lawnmower (Model LM2100SP), and I have been mostly happy with it despite two failures of the self propel drive unit that were both repaired/replaced under warranty. 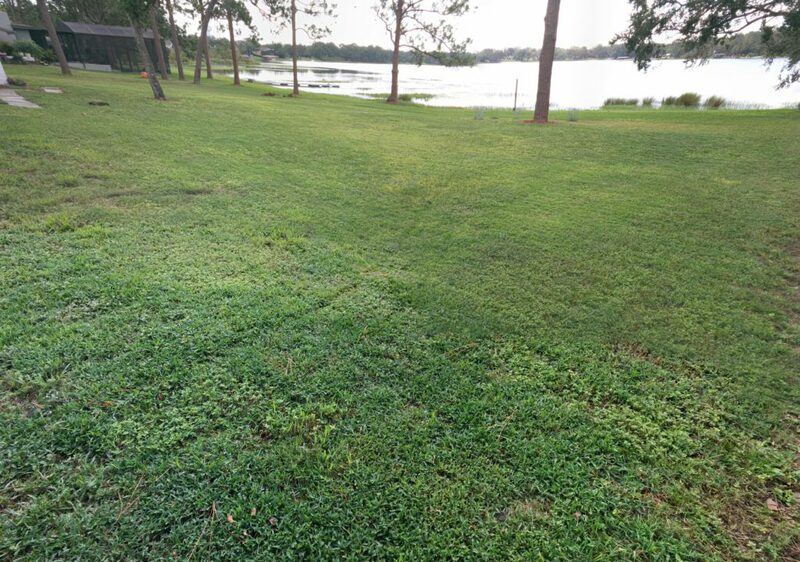 I still believe that an EGO mower is the best option if you are going to be buying a cordless electric mower, but there are a lot of caveats you should know about if you are trying to decide between it and a traditional gas model. The Ego has comparable performance (cutting power) to a gas mower (and an impressive ability to automatically ramp up the torque if needed), but it can’t compete on range with the energy density of gasoline. My mower came with the largest 7.5 Amp Hour (AH) battery, and I need to re-charge it once (winter) or twice (summer) to mow my 3/5 acre yard in two or three sections. I can usually mow for between 30-60 minutes at a charge depending upon conditions (cutting thick wet grass with a dull blade takes a lot more energy than cutting thin dry grass with a sharp blade). As an example, I was able to mow this section of my lawn (from the foreground to just past the pine tree to the right of center) on a single charge (until the status light on the mower turned from green to red, leaving just enough power in the battery to use it in the leafblower to clean off the lawnmower and a short sidewalk). The section was 66′ long by 130′ wide, (8,500 sq ft, or just under 1/5 – 0.195 acres ). This was grass that needed mowing (mowed last about 9 days ago) but wasn’t quite overgrown yet. Time wise, this took me around 45 minutes running with the self propel set to maximum speed. As another data point, in the middle of summer, mowing thick overgrown grass, I was able to mow a 5,200 sq ft section ( 130′ x 40′) on a single charge of a new 7.5 AH battery. With a gas mower you could mow my entire lawn with thick wet grass and a very dull blade and only notice that you needed to re-fill the gas can slightly more frequently. With an electric mower, you learn to keep your blade sharp, and to never mow wet grass (which is good for the lawnmower and your lawn) because it makes a significant difference in your mowers “range”. My lawn is large, and most homeowners would probably buy a riding mower with a wide deck to mow it, so I don’t mind getting a break between each section. [Electric riding mowers were prohibitively expensive when I purchased my walk-behind Ego.] Recharging the battery takes an hour with the included fast charger, so I can mow one section, recharge while taking a lunch break and then knock out a second section. Usually though, I just mow 1/3 of it each day, so the battery charging speed doesn’t really matter. If you wanted to be able to mow almost continuously, you should buy two batteries so that one can be charging while you are using the other. The mower will cost more up-front than a comparable gas mower, due to the cost of the rechargeable battery (The battery and charger is warranted for 3 years, while the mower itself has a 5 year warranty). If the battery lasts a full 5 years, your total cost of ownership will probably be very similar to a gas mower + fuel and maintenance. However, if you were to purchase a used gas mower, you can save a significant amount of money. Purchasing a used electric mower was not yet a viable option for my lawn, as most used electric mowers on the market still make use of lead acid batteries and do not have the comparable performance to the Ego’s 56 volt lithium battery pack. If you have a very small yard (1/10th acre or less), an older used electric mower may still work for you. Once you accept that the energy density of a LiIon battery is significantly lower than gas, there are many benefits to an electric mower. First, it costs me about 5 cents to fully charge the battery (15 cents to mow my entire lawn), and I never have to travel to a gas station to purchase fuel. I will have to purchase a new battery at some point in the future. Currently, it is unclear exactly how quickly the battery will degrade over time. I have detected no degradation after the first four months. It is warranted for 3 years, and I hope it will actually last 5-10 years before I need a new one, but only time will tell. New batteries are expensive, but if technology improves and costs reduce over the next five years, I may just buy an electric riding mower once my Ego walk behind is 5 years old and the warranty expires. Because the mower has no gas or oil, you can turn it to change the blade or fold the handle and stand it upright for storage without worrying about leaks or damage. This is a prime space saving benefit that I feel is one of the main benefits. Because the motor is electric, starting and stopping the mower is as easy as pushing the start button and pulling the bail bar in. No more pull starts, or dealing with a dead starter battery on an electric start model. The mower is MUCH quieter than most gas mowers. Although it makes noise, it is much less disruptive than even a four stroke engine with a good muffler. And of course, you never have to walk through fumes or smoke from an internal combustion engine. It also comes with headlights. This may sound like a gimmicky feature, but since the electric motor is so quiet, you can mow later in the evening without worrying about annoying your neighbors. Because the headlights are down low shining across your lawn, they do a very good job of highlighting the mowed/not-yet mowed division, making it even easier to overlap your tracks slightly than in the daytime. Reading the Ego community forums (after purchasing the mower) I found several common complaints. First, it can leave tufts of uncut grass near the edge of the mower, which can mostly be rectified by overlapping your passes a bit extra. So instead of a 21″ deck, you are really getting the performance of a 19-20″ deck. This may be related to the second common complaint, a lack of suction. Some people complain that it doesn’t always lift leaves or grass upwards enough to cut/mulch. Many of these complaints are from people who bag their clippings and want absolutely everything off of the lawn when they are finished. I use it almost exclusively in the mulching configuration, and am happy with it’s mulching performance. Ego does sell a “high-lift” blade that has more “uplift” specifically designed for bagging operation, which does improve the suction, but at the expense of extra energy usage (shorter runtime). I have the high lift blade and can confirm it does a good job increasing “pickup” when bagging, but I was happy enough with the mulching performance with the standard blade that I don’t use the high-lift blade and bag frequently. Update: The self propel unit failed on my mower a second time after 9 more months of ownership, but I was much happier with how Ego handled the failure, as they shipped me a replacement mower so that I was quickly back in business. You can read about the 2nd failure and replacement at this post. This isn’t a craftsman hand tool where you can buy a broken one at a garage sale and get it replaced. For warranty service, you need to be the original owner, have proof of purchase (if you have not already registered the product), and you MUST have bought the product new, from an Ego certified dealer (Mostly Home Depot, although they do sell on Amazon as well as through some local lawnmower shops.) Note that if you buy an EGO product on Amazon, you MUST make sure that it is “Sold by and shipped from Amazon” to be covered by Ego’s warranty. Many other sellers will sell via the Amazon Marketplace, but they are not Ego authorized dealers, only products purchased directly from Amazon itself are covered by the warranty.